SOME SPEED GIANTS of America are seen in this illustration, taken in the Chicago yards. From left to right they are the “Hiawatha”, streamlined steam locomotive of the Chicago, Milwaukee, St Paul and Pacific Railroad, the “400” of the Chicago and North Western line, the Chicago, Burlington and Quincy Railroad’s “Zephyr”, and the Baltimore and Ohio Railroad’s “Abraham Lincoln”. MANY people have the impression that the Americans experience very little in the way of high speed on their railways. Those who hold such an opinion might be surprised to hear that in the United States runs aggregating over fifteen thousand miles in length are booked daily to be covered at speeds of sixty miles an hour and more from start to stop; and their number is constantly increasing. Further, the fastest scheduled run in the world with steam as the motive power is now being made daily on American metals. Some of these incorrect ideas, no doubt, have arisen out of the stories that circulated in some British newspapers after the return to England of British engines which, during recent years, have travelled across the Atlantic for exhibition purposes. In 1927 the Great Western Railway sent their four-cylinder 4-6-0 “King George V” to Baltimore, to be shown at the “Fair of the Iron Horse” in that city. Afterwards the engine did some trial running over the main line of the Baltimore and Ohio Railroad. On the fastest trip, when “King George V” had attained a speed of seventy-five miles an hour, an urgent summons was transmitted to the driver to “pipe down” to something considerably lower. The newspaper reports represented this as proving that the Americans were afraid of speed, but the explanation was simple enough. The train was approaching a curve over which a definite speed restriction was in force - there are hundreds of similar examples in Britain - so that a reduction of speed was essential for safety. Again, when “Royal Scot” of the LMS returned to England in 1932, after its triumphant tour across North America and back, the British public was told that no express train in America travelled at over forty miles an hour, because “Royal Scot” was limited to that speed on many of the main line routes over which the engine ran. Again the explanation was simple. The locomotives of the kind concerned are fitted with “automatic traffic control” (or, for short, “ATC”) equipment, whereby the position of the signals is repeated in the engine-cab, and a partial brake application results from passing any signal at danger. As the English engine was not so fitted, a limitation of its speed was regarded as a necessary safety precaution. Another fact stressed in the newspapers after the return of “Royal Scot” was that the British locomotive had worked its train without assistance from Vancouver right up to the summit of the Kicking Horse Pass, 5,329 ft above sea-level, whereas a pilot or banking locomotive would be needed with a Canadian train. But it was overlooked that the weight of the British train - of eight coaches behind the engine tender - was only 268 tons, because of the comparatively light construction of British stock, while a standard transcontinental express of the Canadian Pacific Railway might amount in weight to well over a thousand tons behind the tender. Even then the mighty 2-10-4 CPR locomotives require no help up these 1 in 45 gradients when hauling loads of one thousand tons. Nevertheless, though ahead of Britain in some respects concerning the working of express trains, in other ways American railways lag behind. Not only do the vast majority of American roads cross the railways on the level, but there are also innumerable places where the railways cross one another on the level instead of by overbridge or underbridge. Many of these crossings require reductions of speed to sixty or fifty miles an hour. The great freight yards outside American cities have often to be threaded by passenger trains at very low speeds. Even worse handicaps are presented by the lines through such cities as Syracuse, where the busy, main line of the New York Central from New York to Chicago is carried up the main street for a mile, to the “depot”, or station, with the trains travelling at no more than fifteen miles an hour, and the engines mournfully tolling their great bells to warn street traffic to keep clear. Millions of dollars are being expended by the New York Central Lines to remove this anachronism by raising the line to viaduct level. THE “TWENTIETH CENTURY LIMITED” at speed, along the shores of the River Hudson, from which the standard “Hudson” (4-6-4) type locomotive at the head of the train takes its name. The time of this express has now been reduced to seventeen hours for the distance of 958.7 miles between New York and Chicago, and involves an average speed of 56.4 mph throughout, including all stops and speed restrictions. The weight of the train frequently exceeds 1,000 tons behind the tender. When such hindrances as these are taken into account, it will be realized that a high speed is needed between slacks to permit the overall maintenance of reasonably high average speeds over long distances. Exceptional powers of acceleration from slowings are also needed by the locomotives. This fact, together with the enormous weight of the trains, explains the vast development of locomotive power in America, where the largest express locomotive types are twice the weight, size, and tractive power of the biggest engines in Great Britain. Most of the speed developments in America have been the outcome of competition. Between many of the great American cities two or three routes, under different ownerships, are in operation, and at various periods of American railway history competitive time-cutting has proceeded on a lively scale. Aerial and road competition have also had their effect; and, as for the railways themselves, the intrusion into the field of tractive power of the Diesel engine, and the electric motor has spurred the adherents of steam on to unprecedented feats of speed. The result has been to produce, in the year 1935, the most remarkable wave of railway acceleration on record. Many different parts of the United States are affected by these vigorous speedings-up, and the indications are that they represent but the beginning of a speed programme which will become yet more revolutionary as time proceeds. Perhaps the best known of all passenger train rivalry in the USA is the time-honoured competition of the New York Central Lines and the Pennsylvania Railroad for the traffic between New York and the great Middle-West city of Chicago. The Pennsylvania Railroad has the advantage in distance with a route 902½ miles in length. But it leads through the heart of the Allegheny Mountains, and at Gallitzin, twelve miles west of Altoona, passes over a summit no less than 2,194 ft above sea-level - equal to Shap and Beattock of the British LMS main line added together, and still with nearly two hundred feet to spare. This peak altitude is approached by many miles of difficult grades. From the east the line climbs 965 ft in 11.8 miles, at their steepest inclined at 1 in 5 3, while on the west side the line falls 1,004 ft in 25.6 miles to Johnstown. Then there is considerable curvature of the line - including the famous Horseshoe Curve - which forbids anything in the way of high speed over the 433 miles between Harrisburg and Crestline. All the speeding must therefore be done at the two ends of the route, between New York, Philadelphia, and Harrisburg; and between Crestline, Fort Wayne, and Chicago. The New York Central, however, has for its slogan “Water Level Route - you can sleep”, to indicate,presumably, that the speed is maintained at an even level, and that there is no toilsome climbing of heavy gradients during the night hours. This is because the NYC goes northwards from New York up the left bank of the broad Hudson River as far as Albany, there making the right-angled bend which takes it westwards towards Chicago. This is a more circuitous course, measuring 958.7 miles in all, but the level character permits high speed to be sustained over most of the journey, except through the great cities of Buffalo and Cleveland, and, for reasons previously mentioned, through Syracuse. For many years the two crack competing expresses between New York and Chicago have been the “Twentieth Century Limited” of the New York Central, and the “Broadway Limited” of the Pennsylvania, composed exclusively of luxurious Pullman cars. For the special amenities of these flyers, in addition to the fare and Pullman supplement, a “service charge” is made, which in 1935 was reduced from ten to seven and a half dollars (approximately £2 to £1.10.0). Twenty hours was for many years the running time of the “Broadway” and the “Century”, except during a brief period when a schedule of eighteen hours was tried. But it proved too exacting for the engines of the day, and after a disastrous accident to one of the trains it was abandoned. In 1932, however, the eighteen-hours schedule reappeared. In 1933 fifteen minutes were cut from it; and in 1935 the bold step was taken of accelerating both the “Twentieth Century Limited” and the “Broadway Limited” to a seventeen-hours run. This means an overall speed, including every stop, of 56.4 miles per hour by the New York Central route, and of 53 miles per hour by the Pennsylvania, for a journey of nearly a thousand miles. For reasons already given much higher speeds must prevail over certain sections of each route. Between New York and Paoli, on the farther side of Philadelphia (106.3 miles), the traction is now electric; and powerful streamlined electric locomotives take the “Broadway Limited” over the 75.7 miles between Newark, just outside New York, and Philadelphia North in 75 minutes. But steam beats electricity on the “Broadway’s” daily journey. For it is booked on the eastbound run to cover the 140.9 miles from Englewood, a suburb of Chicago, to Fort Wayne in 131 minutes, at an average of 64.5 miles per hour from start-to-stop, and to continue for 131.7 miles to Crestline in 129 minutes. In the westbound direction, the running time from Fort Wayne to Englewood is only 130 minutes, and the start-to-stop average exactly 65 miles an hour. Between Fort Wayne and Chicago other and considerably faster runs are made daily over the Pennsylvania. Chief among them is a Chicago-Detroit express which has now been accelerated to cover the 64.2 miles from Plymouth to Fort Wayne in 51 minutes, at a start-to-stop average of 75.5 miles per hour. At the time of writing this is the fastest run in the world made by steam power, and the fastest American run, whether steam, electric, or Diesel. In the other direction, the corresponding flyer covers the 122.4 miles from Fort Wayne to Gary in 101 minutes, at 72.7 miles per hour. A nother quick run of the many in this area is made by the “Union”, from Cincinnati to Chicago, which runs from Fort Wayne to Englewood, 140.9 miles, in 133 minutes, three stops included. From Fort Wayne to Plymouth the 64.2 miles are allowed only 54 minutes, at a start-to-stop scheduled speed of 71.3 miles an hour. There are other runs in either direction over the same 64.2 miles stretch of line in 60 and 63 minutes, not to mention two runs with an intermediate stop at Warsaw, which are made in 60 and 61 minutes. THE “INTERNATIONAL LIMITED” of the Canadian National Railways at full speed. At the height of the speed competition between the Canadian National and Canadian Pacific Railways, this train was booked to run the 334 miles between Montreal and Toronto in six hours; but the traffic has now been pooled, and the time has been extended to six and a half hours. 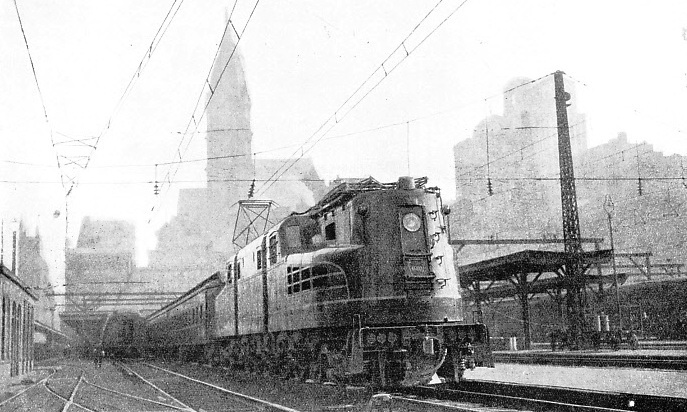 On the New York Central, the fastest running is similarly made in the flat country along the south shore of Lake Erie, between Buffalo, Cleveland, and Toledo, and onwards through Elkhart to Chicago. The eastbound “Twentieth Century Limited” has to cover the 227.9 miles from Englewood (Chicago) to Toledo in 222 minutes, inclusive of a stop at Elkhart. Another very fast train is the “Commodore Vanderbilt”, also from Chicago to New York. This covers the 133 miles from Elkhart to Toledo in 125 minutes, while in the other direction the “Lake Shore Limited” accomplishes the 123.1 miles from Toledo to Goshen in 115 minutes, at a scheduled speed of 64.2 miles an hour. Between Buffalo and Cleveland the longest non-stop runs of the New York Central Lines are made. The distance from Buffalo to East Cleveland station is 178.1 miles, and a number of trains cover the distance without an intermediate halt, the eastbound “Commodore Vanderbilt” and “South Western Limited” both taking the level three hours for the journey. The Pennsylvania beats this lengthy break with the 188.7 miles run between Pittsburg and Crestline, over which five non-stop journeys are made every day, with three others making the slightly shorter non-stop journey of 175.2 miles between Pittsburg and Mansfield. So remarkable has been the 1935 speed-up between New York and Chicago that whereas, at the beginning of 1932, no other express ventured to come within less than an hour or two of the twenty-hour schedule of the exclusive “Twentieth Century” and “Broadway Limited”, to-day the eastbound “Commodore Vanderbilt” of the NYC and the “Liberty Limited” of the Pennsylvania have both come down to 18 hours 20 minutes. Seventeen other expresses complete the journey in less than twenty hours, and thirty expresses in all - fifteen daily by either route - average 19¼ hours in their overall travelling time. Over two main lines, each nearly a thousand miles long, there is nothing else in the world to compare with such long-distance speeding and frequency of service as this. While for the “Twentieth Century Limited” and the “Broadway Limited” themselves, a cut of three hours in either schedule, spread over no more than three years, is an achievement of which their owners may well be proud. An alternative route of the New York Central is used by certain of the Chicago expresses, taking the north side of Lake Erie from Buffalo, and so through a corner of Canada to Windsor, after which the Detroit River is crossed to Detroit, and the run is continued on USA territory to Chicago. The lines concerned belong to the Michigan Central Railroad, a subsidiary of the New York Central. This section is noted not only for its high speed - three expresses, for example, make the 109.6 miles run between Windsor and St. Thomas in 107 minutes - but, in addition, for the enormous weight of its trains. A few years ago a complaint was lodged with their union by the conductors on this section because the trains were being made up to formations of eighteen coaches and upwards. This meant that they were unable to complete their ticket-checking on two-hour nonstop runs. A load of twenty-three twelve-wheelers of American stock appears to be the record, and this load probably weighed at least seventeen hundred tons behind the engine tender. “ABRAHAM LINCOLN”, one of the new high-speed trains of the Baltimore and Ohio Railroad. The 4-4-4 locomotive “Lady Baltimore”, hauling the express above, is of a recent type, specially built for speed, and the coaches, streamlined throughout, are also of all-welded construction, by which their weight has been considerably reduced. On the “Twentieth Century Limited”, and other expresses nearly as fast, loads exceeding a thousand tons in weight are not uncommon. They are hauled by the magnificent “Hudson” type 4-6-4 locomotives of the New York Central Lines, which are also used on the Michigan Central Division. 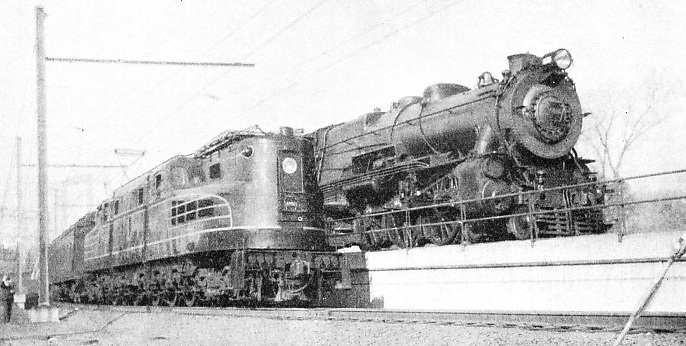 The Pennsylvania, however, is content with “Pacifics” of generous dimensions for its high speed work, and with “Mountains” of the 4-8-2 type - very appropriately named - over the heavily-graded section of the line through the Allegheny ranges, except, of course, on the electric section between New York and Paoli. Electric working plays a small part on the New York Central main line, as electric locomotives haul the trains from New York out to Harman, a distance of 32.7 miles, where a change over to steam takes place. When the “Century” is run in several sections - as is frequently necessary - the track arrangements between the Grand Central Terminal at New York and Harman are such that it is possible to start them all at once, and then to string them out suitably so that they follow one another at close intervals through to Chicago. A distinguished record of the “Broadway Limited” is that of having arrived dead to time on 362 days out of 365 in one year - a record probably unequalled by any other express in existence. Another historic competition has for many years taken place between the Pennsylvania and the Philadelphia and Reading Railroad, or the “Reading” for short, for the traffic between New York and Philadelphia, and between both these cities and the popular resorts of the Atlantic coast. It was the Reading Company that here established what for a considerable time was the world’s fastest railway run. Phila-delphia business men living at Atlantic City, and returning home in the afternoon, were ferried across the Delaware River to Camden, and then taken to the coast in the “Boardwalk Flyer”. To complete the whole trip in the hour, of which the ferry monopolized at least ten minutes, it was necessary to book the express over the 55.5 miles between Camden and Atlantic City in 50 minutes. The train was an amazingly good time-keeper. Time and again precious minutes which had been lost by the ferry were regained by the locomotive. 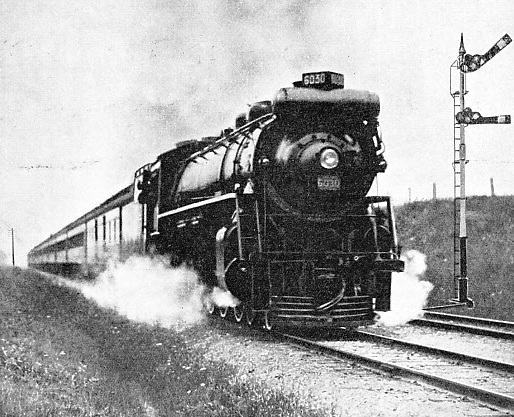 The “Atlantic”, or 4-4-2 type of express engine, was first introduced on this service, from which it derived its name. The driver’s cab was perched astride the boiler, ahead of the firebox, to give a better look-out ahead, with the fireman in a cab of his own, located in the customary position. Speeds of 90 miles and over were common, and the fastest time on record - 42 minutes 33 seconds - was made in May, 1905. This run, with its start-to-stop average speed of 78.3 miles an hour, was probably the fastest ever made on any railway from dead start to dead stop until the 81.7 miles per hour Swindon-Paddington run of the Great Western Railway in June, 1932. Now, however, the Pennsylvania and the Reading have joined forces, and consolidated their city-to-coast services, under the title of “Pennsylvania-Reading Seashore Lines”. The “Boardwalk Flyer” to-day requires 57 minutes for its 55. miles run, though it is far heavier than in the days of its 50 minutes exploits. Other very fast trains of both companies connect New York and Philadelphia every hour in either direction. For the Reading Company this means that the 49.2 miles between Bound Brook and Jenkintown must be covered in a standard hourly time of 49 minutes in one direction, and 50 minutes in the other, every run including an intermediate stop at West Trenton. All the short runs on this service must thus be reeled off at start-to-stop speeds of a mile a minute; but for the most part, the trains consist of four-car and five-car formations only. 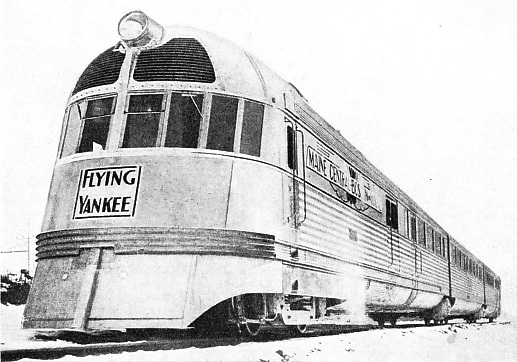 “FLYING YANKEE” is the Boston and Maine Railroad’s new three-car high-speed unit, built of stainless steel and streamlined throughout. Power is supplied by a 600 hp Diesel engine producing electric current through a dynamo, and the propulsion of the cars is electric. As for the Pennsylvania, a procession of flying expresses, day and night, travels to and from all parts of the Middle West, the western, and the southern states, and occupies the main line between New York and Philadelphia. This is easily the busiest main route in the world. Between Newark and North Philadelphia, thirty-two trains daily are booked to cover the 75.7 miles in times varying from 75 down to 71 minutes. Among these is the “Congressional”, which with electric haulage throughout, has in 1935 for the first time brought the New York-Washington journey below the four-hour limit. The distance of 224.8 miles is now covered in 235 minutes, including stops at Manhattan Transfer, Newark, North Philadelphia, Wilmington, and Baltimore. in its turn has stirred up the Wabash and the Illinois Central Railroads. The former’s “Banner Blue” express now makes the run of 286 miles by the Wabash route in 5½ hours, and the Illinois Central built Diesel - electric trains are scheduled to keep the same-time. This brings us back to Chicago, and to what, in 1935, proved the most exciting burst of competition in speed that America had ever known. The exploits of a Diesel train were again responsible for precipitating an advance in speed so great that it has cut ten-hour schedules down to 6½ hours. The cities concerned are Chicago and Milwaukee, on the west side of Lake Michigan; and the so-called “Twin Cities” of St. Paul and Minneapolis, a little over four hundred miles from Chicago by three different routes. First of all the Chicago, Burlington and Quincy Railroad built a Diesel-operated train of three cars which it christened the “Burlington Zephyr”. A remarkable inaugural run was made, in which the 1,015 miles from Omaha to Chicago were covered without a stop in 13 hours 5 minutes; 130 miles being covered at an average speed of ninety miles an hour. The CB and Q then announced its intention of building two more of these “Zephyr” units, and of introducing them on the service between Chicago and the “Twin Cities”. But the competitors decided to get ahead of their rivals, and to demonstrate what could be done with steam. First of all, the Chicago, Milwaukee, St. Paul and Pacific staged a journey with a 4-6-4 locomotive and five cars, in which the 85 miles from Chicago to Milwaukee were covered in 67 minutes 35 seconds, and 68.9 miles were covered at an average of all but 90 miles an hour. Already the CMStP & P had cut the Chicago-Milwaukee schedule to 90 minutes, but this was promptly pared to 85 minutes, and the decision was reached to build special streamlined locomotives and trains to make possible a much faster service, not only to Milwaukee, but to St. Paul and Minneapolis as well. DIESEL PROPULSION is seen in the new “City of Portland” express of the Union Pacific Railroad, which is now in service between Chicago and Portland, on the Pacific coast. This six-car unit, with dining and sleeping accommodation, travels over the 2,272 miles, including the crossing of the Rockies, in 39£ hours, as compared with the 58 hours by the best steam service. Then the Chicago and North Western quietly stepped in, and, in fact, got a substantial lead over its competitors. On January 2nd, 1935, a new express, called “The 400”, was introduced, the name being derived from the fact that four hundred miles of its daily journey were to be covered at a mile a minute. The 85 miles between Chicago and Milwaukee were booked to be covered in 80 minutes, and the 408.6 miles between Chicago and St. Paul, stops included, in seven hours. Reliance was placed on existing “Pacific” locomotives, three of which were rebuilt with higher pressure, oil-fired boilers, disk driving wheels, and improved lubrication. So popular did the service become that the original four-car formation grew to five cars, then to six. In the first three months 28,000 passengers were carried, and despite snow and below-zero temperatures, a fine record for punctuality-was maintained. By mid-May, the Chicago, Burlington and Quincy had put its two new “Zephyrs” in service between Chicago and the “Twin Cities”. The CB & Q route passes to the south of those of the other two competitors, and does not touch Milwaukee, but it is longer, the distance from Chicago to St. Paul being 431 miles. Yet the Burlington administration determined, distance notwithstanding, to cut the Chicago-St. Paul time to six and a half hours. This entailed an average speed of 66.3 miles per hour, including four stops, and its fastest stage - from North La Crosse to East Dubuque, on the eastbound journey, 116 miles in ninety-five minutes - required a start-to-stop average of 73.3 miles an hour, which at present is the fastest booked run on the American continent with Diesel propulsion. Again the public response was immediate. Each three - car “Zephyr” unit seats eighty-eight passengers, and provides also restaurant accommodation and luggage space. Such was the demand for accommodation that an average of forty passengers daily had to be refused seats. In consequence the CB & Q came to the decision that each “Zephyr” must make the double journey every day, 882 miles all told; one of the two trains running from Chicago to Minneapolis and back, and the other from Minneapolis to Chicago and back, so that at the time of writing the Burlington has two 6½-hour trains daily in either direction between Chicago and St. Paul. In a “trial heat”, on April 6, 1935, one of these trains made the journey in five hours thirty-three minutes, and it is claimed that a speed of 104 miles an hour was reached. By the end of May 1935, the Chicago, Milwaukee, St. Paul and Pacific Railroad was ready, and the “Hiawatha” took the field. For the service two new trains have been built, each consisting of six cars, and seating in all 265 people. A new type of coach, reduced one-third in weight from normal American construction by the use of all-welded steel construction, has been built, and the whole train is streamlined, and finished off at the back with a “beaver tail”, to lessen air resistance. Streamlined “Atlantic” locomotives of new design have also been constructed, with boilers working at 300 pounds per square inch pressure, and many novel features. 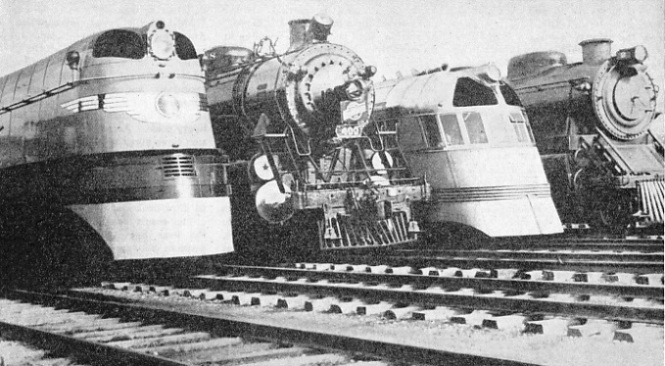 One of these trains was tested out on May 15, 1935, and made the run of 141 miles from Milwaukee to New Lisbon in 113 minutes, at an average of 74.9 miles per hour. ELECTRICITY plays a prominent part in express train operation in the eastern states of America. The Pennsylvania Railroad has now electrified its main line throughout the 224 8 miles from New York to Washington. The best express covers the distance in 235 minutes, including stops at Philadelphia, Wilmington and Baltimore. In this photograph one of the hourly express trains is seen leaving Broad Street Station, Philadelphia, for New York. Starting from Chicago, the “Hiawatha” on its normal run first races over the eighty-five miles to Milwaukee in seventy-five minutes - 68 miles per hour from start to stop - and then continues to Portage, 92.9 miles, in 84 minutes, at 66.4 miles per hour. The 43.1 miles from Portage to New Lisbon are run in 36 minutes, at 71.8 miles per hour, and the 59.8 miles from there to La Crosse in 53 minutes, at 67.7 miles per hour. This gives a total time of 4 hours 11 minutes for the 280.8 miles from Chicago to La Crosse, and an overall average speed of 67.1 miles per hour, including three stops. The rest of the 6½-hour journey from Chicago to St. Paul (409.9 miles by this route), is timed at just under the mile-a-minute rate. Similarly in the reverse direction, 4 hours 11 minutes is the time allowed from La Crosse to Chicago, and the quickest stretch is from New Lisbon to Portage, as only 35 minutes are allowed for the 43.1 miles, demanding a start-to-stop average speed of 73.9 miles per hour. This is thus the second American steam-hauled express to beat the schedule of the “Cheltenham Flyer”. The maximum running speed, sufficient to maintain the schedule, is fixed at ninety miles an hour. In addition the CMSt.P & P has speeded up various other expresses on, the eighty-five miles run between Chicago and Milwaukee, two covering the distance in eighty minutes, and three others in eighty-five minutes. Meanwhile, of course, the Chicago and North Western has also come down to a six and a half hours run between Chicago and St. Paul. As with the CMSt.P & PRR, the eighty-five-miles Chicago-Milwaukee stage is run in seventy-five minutes. Another high-speed stretch is between Milwaukee and Adams, 124.5 miles run both ways in exactly two hours. It is at Adams that the eastbound and westbound C and NW flyers meet; as this station is approached in either direction by fifty miles of single track, the strictest punctuality is essential, since, on such timings as these there is little or no margin for recovering lost minutes. It is therefore clear, from such details as these, that high speed pays, and that the challenge of Diesel propulsion has resulted in the discovery of possibilities in steam locomotion hitherto unexploited. Before these accelerations it took an average of ten hours to travel by rail between Chicago and St. Paul. Now there are eight flyers daily performing the run of from 408½ to 431 miles, according to route, in six and a half hours -390 minutes - four in each direction. Were the same developments to take place in Great Britain, it would be possible four times daily to make the journey from London to Edinburgh or Glasgow in about six and a quarter hours, instead of the existing best times, even with such expresses as the “Flying Scotsman” and the “Royal Scot”. There is yet another competitor between Chicago and Milwaukee, and that is an electric line known as the Chicago, North Shore and Milwaukee Railroad, which has the distinction of operating one of the fastest electric services in the world. It is one of America’s many so-called “interurban” railways, developed from the original urban tramways round large cities by linking those cities together - whence the name “ interurban”. Almost all the interurban railways are “trolley” lines. That is to say, they work on the overhead electric system, and some of them are so advanced as now to include parlour cars, dining-cars, and even sleeping-cars in their trains. THE RIVALS. 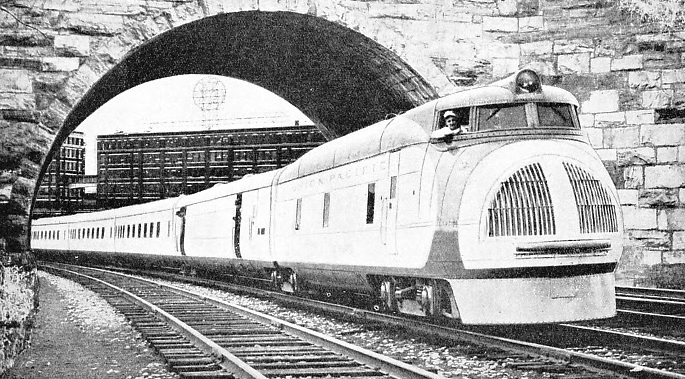 One of the latest streamlined electric locomotives of the Pennsylvania Railroad alongside a standard “Pacific”. The “Broadway Limited” and other famous Pennsylvania expresses are worked by electricity between New York and Paoli (Philadelphia), but steam takes over from there to Chicago. The fastest steam-hauled run in the world, on which a Pennsylvania “Pacific” is used, is made over this route, from Plymouth to Fort Wayne, 64.2 miles in 51 minutes, at 75.5 miles per hour from start to stop. The Chicago, North Shore and Milwaukee makes use of street lines at either end of its journey, but intermediately, along the western shore of Lake Michigan, the trains do some extremely fast travelling. The “Chicago Special” runs the 74.1 miles between Harrison and Howard Street, Chicago, in 68 minutes, including three intermediate stops. From Kenosha this flyer must cover the ten miles to Racine in eight minutes, start-to-stop, and then clear Edison Court, 15 miles farther on, in 13 minutes more, and as the time-keeping record of this line is exceptionally good, it is obvious that these are not merely “paper” timings. Two other expresses cover the same 74.1 miles in 73 and 75 minutes, also stopping three times on the way, and the standard time for ordinary trains, with six stops, is only 80 minutes. Other interurban railways have start-to-stop bookings up to a mile a minute in speed, though not quite so spectacular in their schedules as the CNS & MRR. In many other directions American speeds are gradually creeping up, and not a few journeys of over one thousand miles in length can now be completed at over fifty miles an hour throughout. The “St. Louisan” of the Pennsylvania, for example, takes the passenger over the 1051.7 miles from New York to St. Louis in 21 hours at 50.1 miles an hour. The “South Western Limited ” of the New York Central, with 105 miles farther to go, takes 22 hours to minutes, and averages 52.2 miles an hour. The latter uses the tracks of the Cleveland, Cincinnati and St. Louis RR, or the “Big Four”, as it is known, subsidiary, from Cleveland to St. Louis. From New York, Philadelphia, and Washington southward to the popular Florida coast resorts, also, similar speed is now maintained by the principal trains. West of St. Louis and Minneapolis lies the broad rampart of the Rocky Mountains, which reduces average speeds to and from the Pacific Coast; though these have risen very considerably since the introduction of the Union Pacific Railroad’s six-coach Diesel-driven train, which in 1934 made the fastest American Pacific to Atlantic run in history, from Los Angeles to New York in 56 hours 55 minutes. The “City of Portland” is now running twice weekly in either direction over the 2,272 miles between Chicago and Portland in 39¼ hours, so averaging all but 58 miles an hour. This compares with the 58 hours of the best ordinary steam-hauled express - the “Portland Rose”. The New England lines have hitherto proceeded more sedately in the matter of speed, but here also Diesel propulsion is making headway. The Diesel-operated “Comet” of the New York, New Haven and Hartford makes the 43.3 miles run between Boston and Providence five times daily in 44 minutes (it took from 55 to 75 minutes before), and the similar “Flying Yankee” of the Boston and Maine covers the 111.3 miles between Boston and Portland in 110 minutes. Years ago, between the Canadian National and the Canadian Pacific Railways rivalry arose as to which should obtain the passenger traffic between the cities of Montreal and Toronto. The CNR came down to a six-hours run over its 334-miles route, and this average overall speed of 55.7 miles per hour, with four intermediate stops, required the “International Limited” to make several point-to-point runs at over a mile a minute. Then the Canadian Pacific speeded up to 6¼ hours, over a distance six miles longer than that of the CNR, and two-thirds of it single track. The result was that, over its double-track section, the CPR booked its two principal expresses at speeds until then unknown in North America. From Smith’s Falls to Montreal West is a distance of 124 miles, and this was scheduled to be covered in 109 minutes westbound and 108 minutes eastbound. 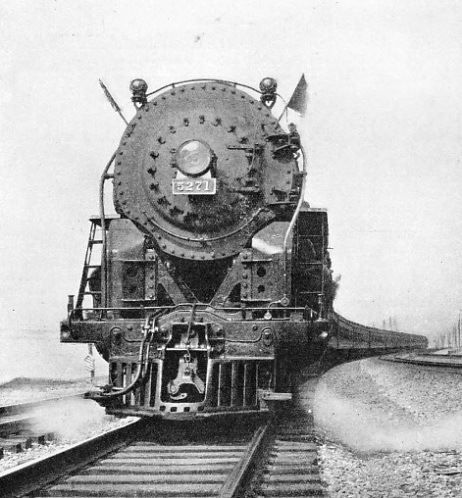 Enough has been written, not only to show that the Americans are no strangers to high railway speeds, but also that, if American acceleration proceeds in the future as rapidly as it has done during the past year or so, the Americans will presently have few rivals in the’ speed of their crack trains, unless there are rapid developments elsewhere. STREAMLINING on the New York Central Lines. 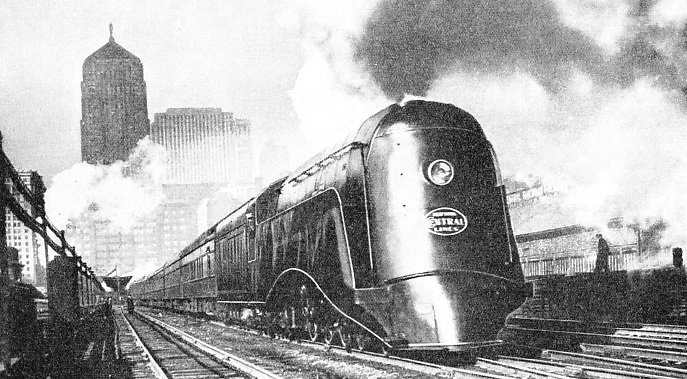 The “Commodore Vanderbilt” is one of the famous “Hudson” (4-6-4) type express locomotives of the New York Central, which, as an experiment, has been fully streamlined. It is hauling the first section of the “Twentieth Century Limited” express out of La Salle Street Station, Chicago, and will take the train to Toledo. You can read more on “The American Comet”, “The International Limited”, “North American Railroads”, “The Pennsylvania Railroad”, and “A Run on the Twentieth Century Limited” on this website.